Substitute Scott Boyd handed Kilmarnock their first win in two months as they held on for a scrappy 1-0 victory over St Johnstone in Perth. The defender was thrown into the action early in the first half and ensured his side came out on top of a ugly affair with his 76th-minute strike. 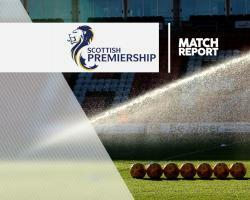 Saints dominated the opening period and felt they should have had a penalty when Boyd clattered into Steven MacLean. The striker's mood only grew darker when he was flagged offside as he found the net moments later. Saints, however, missed out on the chance to climb back above Rangers as they remained in fifth. Boyd was introduced just 15 minutes in after Jonathan Burns suffered a broken nose. The defender's his first involvement saw him do just enough to put off Steven Anderson as the Saints skipper looked to tap home from Liam Craig's corner. Team-mate Souleymane Coulibaly was not so attentive as he let Craig go free to connect with Ricky Foster's cross from deep on the right, but Killie keeper Jamie MacDonald saved his colleague's blushes with a stunning reflex stop. MacDonald was needed again moments later as he tipped away Blair Alston's drive from Chris Kane's lay-off. The visitors found their feet after a shaky start, but left boss Lee Clark tearing his hair out as teasing deliveries from Jordan Jones and Coulibaly failed to find takers. Referee Steven McLean was standing just 10 yards away with an unobstructed view, but inexplicably waved play on. Saints striker MacLean had the ball in the net eight minutes before the break, but had his celebrations were quickly curtailed by the assistant's flag before Murray Davidson pushed a shot wide. Kilmarnock found themselves three on one in the final seconds of the period, but Coulibaly wasted the chance when he delayed his pass so long Jones could not avoid running offside. The second period took time to get going, although Kilmarnock midfielder Rory McKenzie came close to bringing the game to life in explosive fashion as he rattled a 25-yard effort just past a post. Kane could only head straight at MacDonald from close range, but chances were thin on the ground as the sides scrapped it out. There was not much quality on show as the game grew increasingly disjointed. But out of nowhere Boyd struck the opener, prodding home from five yards out when Saints failed to deal with Jones' in-swinging corner. Saints sub Graham Cummins had one last chance to rescue a point, but was denied when Killie full-back Luke Hendrie darted back to his goal-line to produce a last-ditch block.